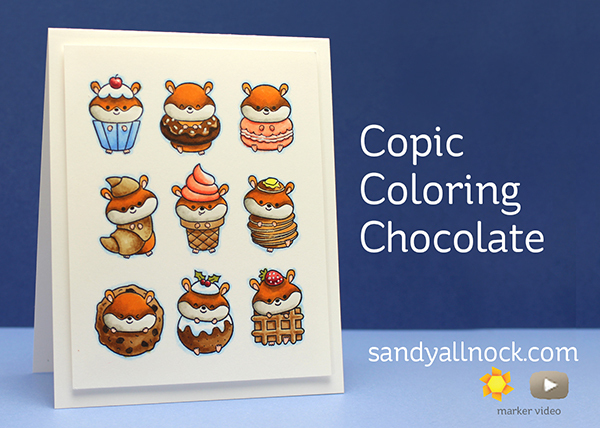 Copic Coloring Chocolates. And other sweets! I have a wicked sweet tooth….bakeries are dangerous! But these little sweeties sent to me by Clearly Besotted don’t add one inch to my waistline, so I indulged in coloring alllllllllllllll the sweets! Watch the video below or click HERE to watch in HD on YouTube. When a card has this much beautiful coloring on it, the design can stay super simple – so I just popped the layer on a clean white card base. Easy peasy! What a yummy post! Love it! Sadly, I am having the worst week ever at work with today being the peak of crazy. I could use a donut. Or a dozen. And some cupcakes. Oh, a cookie would be nice too. Thanks for bringing a needed smile to my face. Such an adorable card! I love the final touch with the pale blue to make things pop and your waffle coloring looks so realistic. The croissant is chocolate filled and the ball is a plum pudding.. you colored them all so wonderful.. the macaroon is so cute in the pink!! I just love baking sweets!! Dare I say — sweet. 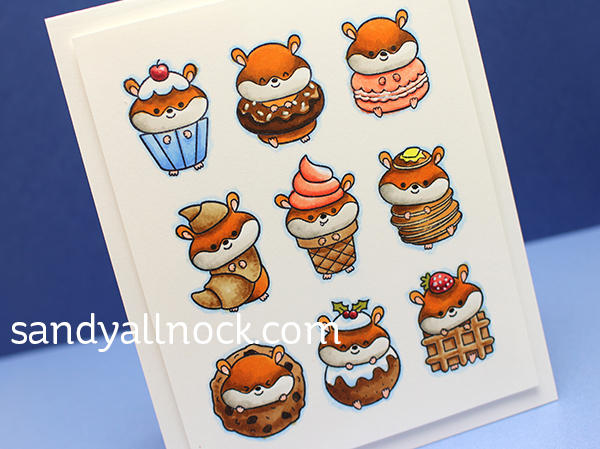 Love these cute critters and overall design. Adorable. I think you need to make yourself sweet treats after this one! You deserve it.